This story begins and ends in the far north, in the capital city of Manitoba Canada, Winnipeg, where two residents and their dogs narrowly escaped a raging house fire. It was a terrifying night, one that Richard Wagner and Nate Schnerch say they will never forget. 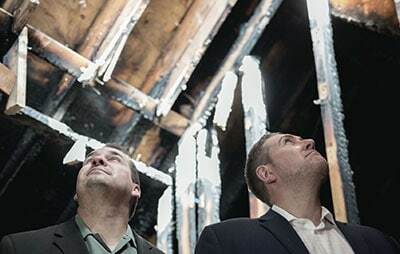 Awakened by their ADT smoke detector, Richard and Nate ran from their home as it was second- by-second consumed with flames. Receiving the alarm signal at one of ADT’s Customer Care Centers in Canada was Gloria Renato who spoke with a panicked Richard. Gloria had called the home to confirm the fire and immediately dispatched local firefighters. 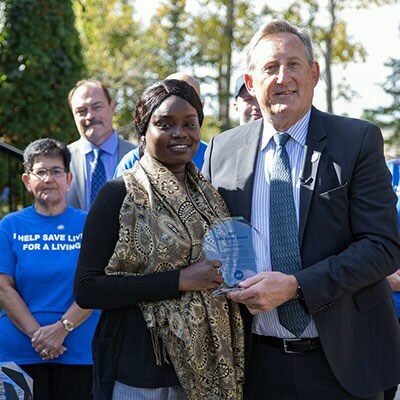 “If we didn’t have ADT, we would have been overwhelmed with smoke"
Safe from harm and picking back up their lives, Richard and Nate met Gloria for the first time in an ADT LifeSaver celebration where she was awarded a LifeSaver, ADT’s highest recognition. Though this story begins in the far North, its lessons can be appreciated anywhere by anyone. At ADT we are grateful for another lifesaving outcome and once again forever in awe of our first responder partners who are an integral part of ADT’s commitment of Real Protection.